The Canon EF 85mm f1.2L USM II is a fast short-telephoto lens that delivers superb optical performance. A maximum aperture of f/1.2 makes it the professional's choice for shooting in low light conditions, or portraiture with a shallow depth of field and smooth bokeh. 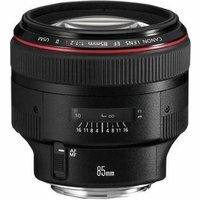 The Canon EF 85mm f1.2 USM II lens also features a fast, quiet autofocus, Super Spectra coatings, and a circular aperture.